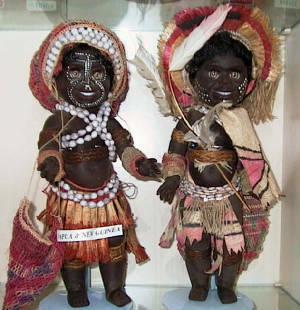 The Aborigines are a brown skinned people of medium height, with slender limbs and black wavy to frizzy hair. They have wide nostrils, thick lips and heavy brows over deep-set brown eyes. The face protrudes. Being tribal hunters they do not stay in one place for any length of time, so they have no permanent homes and very few possessions. They build shelters of any variety of materials leafy branches, grass, bark, reeds etc. The women are food collectors, they dig for roots, grubs yams, collect seeds, fruit and eggs and catch small animals such as lizards and snakes. They do the cooking and also collect firewood and drinking water. Women also make string bags, baskets, bark dishes and mats, and ornaments of grass, reeds, palm leaves animal hair and skins. The men are the hunters and fishermen, using spears, nets, traps, clubs and the well known boomerang. Children have very few toys - boys have smaller versions of the men's weapons - girls have no dolls whatsoever. They are very cleaver at "Cat's Cradle" a game with a circle of string. Musical instruments consist of a tube 10" long, which makes a droning sound when blown. The Aborigine wears either no clothes at all or a very simple string apron attached to a girdle. Sometimes an armlet, forehead band or bone nose-pin are worn. On festival or ceremonial occasions special ornaments such as emu feathers or cockatoo feathers head plumes are worn and designs are painted on the body in red, yellow and white oche (clay) and charcoal, or feather down is stuck to the body with human blood. The life of the Aborigine to-day varies according to their contact with the white man. A small minority still follow the tribal way of life, while many now live in contact with Government and Mission stations or take seasonal work as stockmen and drovers on cattle and sheep stations, but the latter groups return to the tribal ways for varying periods of weeks or months during the year. Some seek regular employment as labourers and some do valued work with the police as trackers. This is a large Maori doll, she is 20" high, marked on back of neck "Pedigree" made in NZ, when walked her head twists and turns, her eyes open and close. This lovely doll is dressed in traditional costume. In her hand she is holding "pois", they are round balls connected by a cord and used in a number of rhythmic dances to the accompaniment of an ancient chant for which the Maori is renowned. Around her neck she wears a tiki. Maori men are renowned for their skill as wood carvers. The Maori Meeting Houses are lavishly decorated with panels of ancient design and elaborate carvings. Dolls made of rubber. Dressed with shells, raffia and other local plant materials. Height 14"